When one thinks of the Mediterranean - one thinks...sparkling aqua oceans, skin slick with heat, dusty olive groves, endless sunshine and colourful fresh fare! This dish seems to encapsulate all of that, and paired with a crisp Pinot Grigio and crispy ciabatta bread, you have yourself a summer weekend winner to inspire a get-together with friends and family. 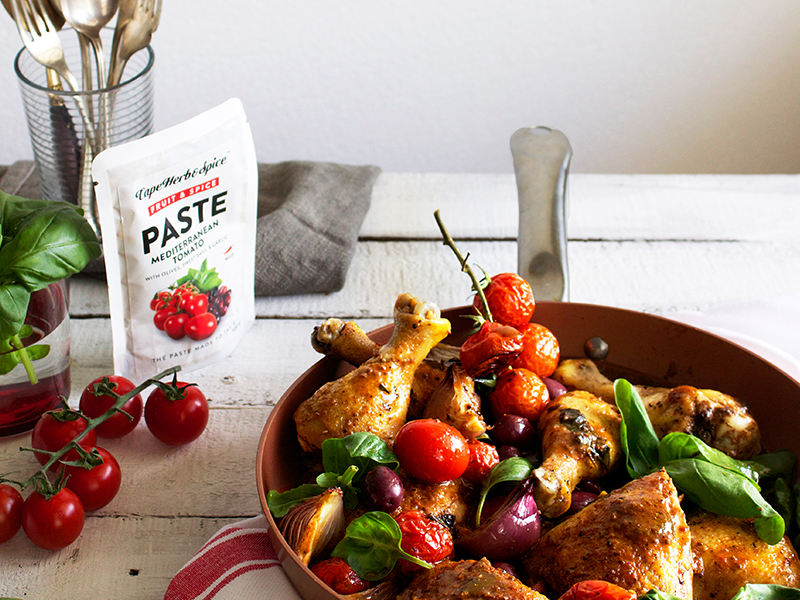 Marinate the chicken in the Mediterranean Paste for at least an hour. Tumble the tomatoes into a large oven-proof casserole. Place the chicken on top and insert olives and onions in the spaces in-between. Drizzle generously with olive oil, cover and bake in a 150˚C oven for 30 minutes. Remove the cover and continue baking for a further 30-40 minutes until the chicken is fall-off-the-bone soft, golden and juicy. Garnish with a generous scattering of basil and serve right away with fresh, crusty ciabatta.